Ey kwesé e’mi.. “it is good that you are here”. Welcome to Chilliwack, situated in the traditional territory of the Stó:lō Nation – spanning from the community of Yale in the Fraser Canyon to the mouth of the Fraser River. In Halq’eméylem, the language of the region, “Stó:lō” translates as “river”. The Stó:lō First Nations people, or “people of the river” have always lived in the region and their ancient stories, history, culture, teachings and knowledge of the area passed down through the indigenous generations in an oral tradition. 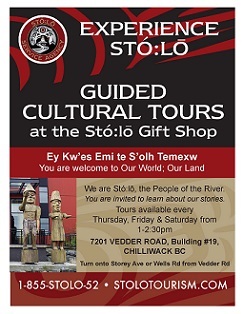 Please call us AT: 604-824-3211 or email: stolo.tourism@stolonation.bc.ca or visit us at 7201 Vedder Road (SRC Bld #10) for educational guided grounds and regional road tours, artifacts, fine arts and historical information​. An exceptional experience of the Stó:lō people: The Shxwtà:selhawtxw Longhouse Extension Program, known as the House of Long Ago and Today offers a unique hands-on and interactive approach to experiencing how the Stó:lō lived, and, how they live today. 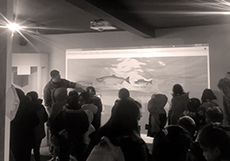 At Shxwtà:selhawtxw, you will be guided by Stó:lō cultural interpreters who will tell stories and legends, demonstrate the art and technology, and explain the artifacts and exhibits on display. 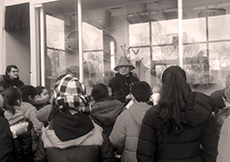 Your experience is only heightened by visiting the Coqualeetza Educational Longhouse, with fires and unimaginable ambiance. 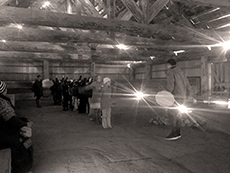 The Coqualeetza Educational Longhouse serves as a sanctuary for Stó:lō traditions, knowledge, and ceremonies. It is an important site for community gatherings, celebrations, and ceremonies. It purpose is to be a true community educational building where Stó:lō neighbors can experience and learn about the Stó:lō culture. The Coqualeetza Longhouse is available for rent on an hourly and daily basis. Call for rates. Traditional Salmon meals are available for your group at an extra cost.